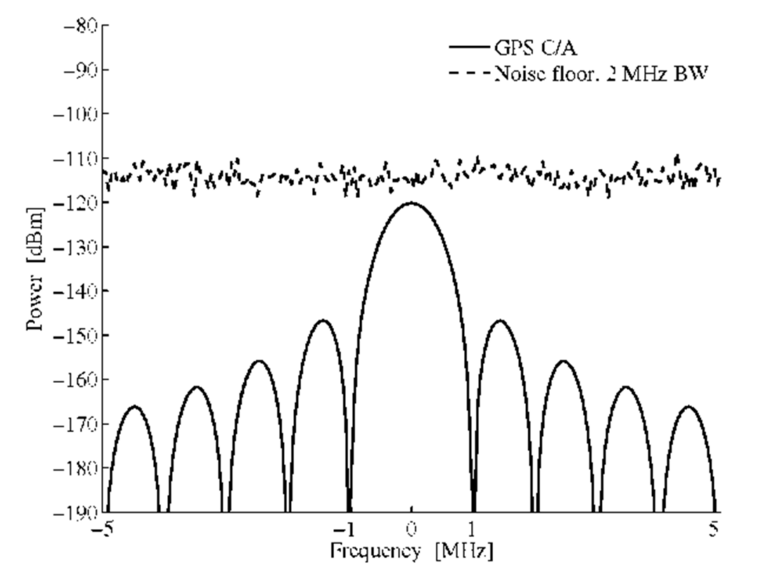 GPS signals are very weak, coming in at about 120 dBm ... which is below the thermal noise floor of ~ 100 dBm! If you try plotting an FFT 2 MHz wide about the L1 frequency you won't be able to distinguish the signal from the noise. But it is there, and we can find it! First, we need data. 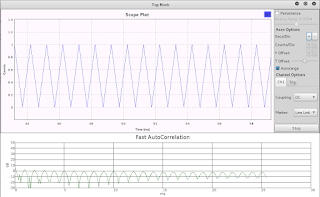 I used data collected with an RTL-SDR stick converted to complex output. The output from the RTL-SDR is interleaved unsigned short, whereas the input block expects signed complex numbers. I talked about this in a prior post; I use the gcc code myself. 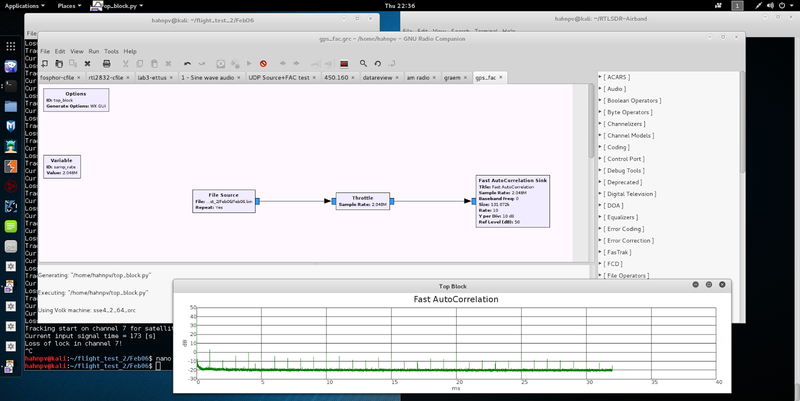 So when we have data we can build a very simple flow diagram in GNURadio to play back the file and visualize it using the Fast Autocorrelation Sink. 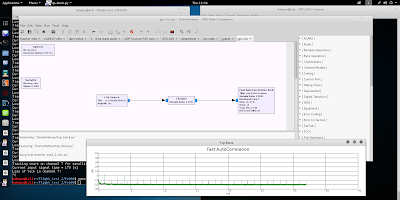 As noted in a previous post, there is a bug in GNURadio which breaks the Fast Autocorrelation Sink, but it is an easy fix! The Fast Autcorrelation Sink is documented on Balint Seeber's blog and provides links to why the fast autcorrelation sink is indeed so fast! 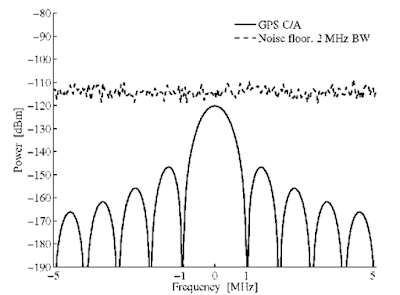 If you aren't familiar with autocorrelation, it is the correlation of a signal with itself. At any given time the correlation of a signal with itself is perfect, but if you insert a time delay and look at a later signal compared to a previous signal we can see just how similar the later signal. For example let's visualize a triangle wave with a frequency of 1000 Hz - that is, 1000 peaks per second, or 1 peak per millisecond. Since each repetition of the triangle is exactly 1 millisecond apart and since there is no noise in the system we would expect that every millisecond we'd have a perfect correlation of the shifted signal to the current signal. In between those milliseconds the correlation would get worse until we were half a millisecond apart where the peaks from the original signal would line up with the troughs of the shifted signal, resulting in a negative correlation. We see our triangle waves with a period of 1 Hz and the Fast Autocorrelation Sink showing peaks at 1 Hz, and negative peak at a rate of 1 Hz shifted by half a Hz. So now let's do it with a real signal. You can use the same flowgraph, we just need to substitute the signal source block for a file source and specify our complex file. And since the file is complex, we need to change the data types. Finally, the throttle should be set to the sample rate of your input source - in my case, 2048000 Hz for the RTL-SDR. For the fast autocorrelation sink you will likely want to tweak the size to make the number of milliseconds a reasonable number. For my use I did (2**18)/2. 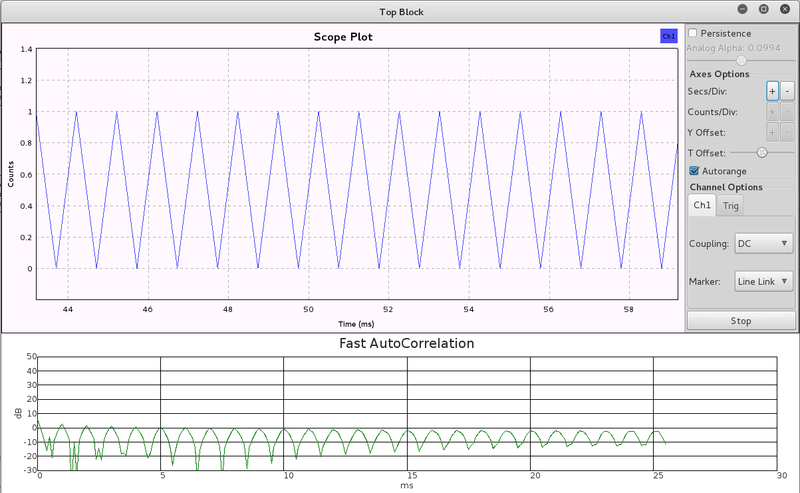 Here's the updated diagram, running with the Fast Autocorrelation Sink, which you can download from github. We see nice peaks every millisecond. Why every millisecond? 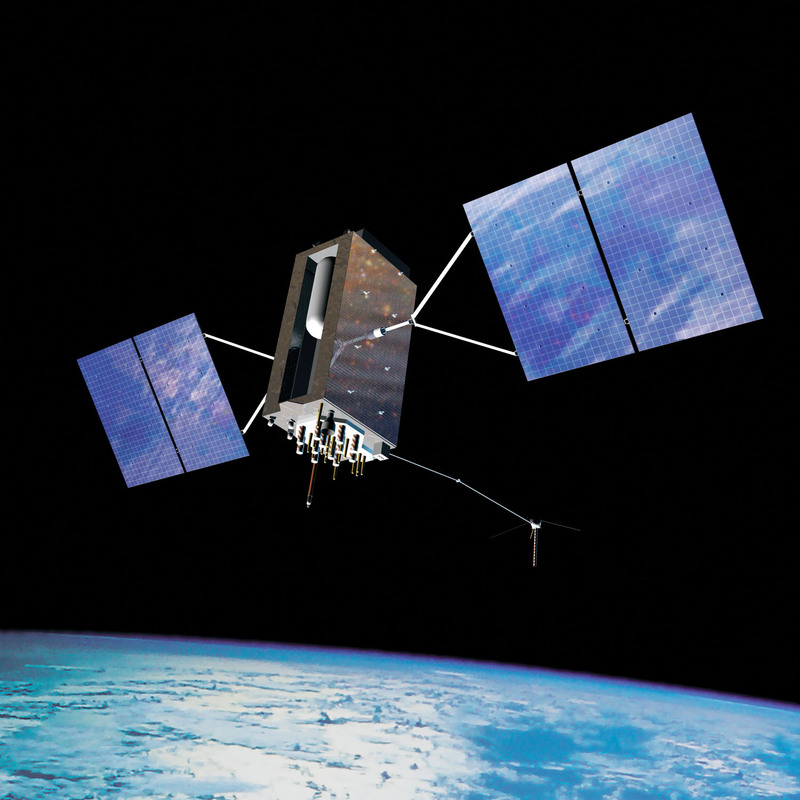 I'm trying to use the gnss-sdr and a USRP for obtaining Galileo Signals with no success for now. I think I have a problem with my antenna or something as I am not able to properly acquire and track the signal.. In fact I think I'll use your idea to check whether my antenna is receiving something or not! The thing is I am not sure whether I "burned" my antenna: I am using a cheap 30$ antenna (and the bias tee from LNA4all). The DC should from 3 to 5V and I went up to 10V (hehe...) I will use your autocorrelator to see whether my antenna is dead or not. If don't see any correlation peak I can assume my antenna is dead. I guess I should be able to find this particular sink after installing the gr-baz code (I mean: cmake... make install etc etc). Should I do something extra? On the other hand I am not able to open the grc using the radio companion. It reports the following error again and again: "FATAL:PARSER:ERR_TAG_NOT_FINSHED:". Yes, if gr-baz successfully installed you will have the fast autocorrelation sink. Do you see any of the gr-baz blocks? If you search for "Baz" you should see ones like "TCP Sink (Baz)" "TCP Source (baz)" etc. If not it is likely that you installed gr-baz to a different prefix than gnuradio.